"Migrant quotas are out of the question" in Europe, François Hollande has stated. After the French Prime Minister, Manuel Valls, it was François Holland's turn to voice his opposition to the European Commission's proposition of imposing migrant quotas on the member states of the European Union. "Migrant quotas are out of the question because we have our rules" on "border control and policies for immigration control," said the French Head of State on Tuesday 19th of May at a press conference in company with the German Chancellor, Angela Merkel. Why the increasing influx of refugees, which are lately just being called 'migrants'? Although many come by plane or road, the most spectacular arrivals are by boat. 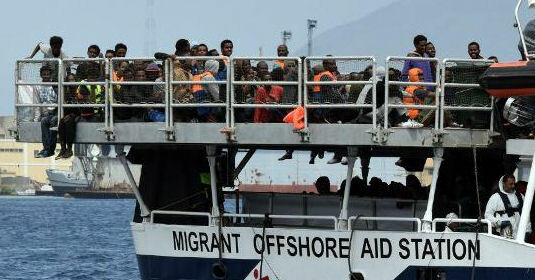 Bigger and bigger boatloads of displaced people are currently floating in various seas and candobetter.net gets press releases daily on the subject from organisations like the International Organisation for Migration (IOM). These migrants or refugees are all fleeing wars that have destroyed their homes and their jobs or are about to. Most of those wars are globalist trade wars led by the US and NATO, purporting to be humanitarian interventions, in the Middle East and Africa. You only have to see where US/NATO are sending money or soldiers to be able to pick the origin of the most recent refugees. For instance, on 19 May 2015 (yesterday) the IOM informed us that "IOM Iraq's Displacement Tracking Matrix (DTM) has recorded 40,608 individuals (6,768 families) displaced by violence in Ramadi since 15 May. Of these, over 39,500 individuals (some 6,600 families) are displaced within Anbar governorate." This is the result of battles with ISIS, which is itself a product of the breakdown of Middle Eastern order through Western invasions based on non-existent "weapons of mass destruction." But Iraq is not the only disrupted place. A huge proportion of Syria's population were stably settled refugees who are now without shelter and certainly in fear of persecution and death from the super sectarian so-called 'rebels and freedom fighters that US/NATO and Australia are supporting, of which the most spectacularly organised are ISIS, which the West now disowns because it has publicly turned against the West. And ISIS is itself an army that people join because they need wages. It is a brutal and rudimentary organising and pirate economic force in countries that have lost much of their infrastructure and administrative systems, and where the people cannot even rely on family and clan anymore because the populations of whole villages and cities have been displaced. Yemen, the poorest country in the region, is now being gutted by Saudi Arabia which appears to have gone on a rampage because it is furious with the United States for talking to Iran, whom it considers a religious enemy. "The conflict in Yemen has now entered its second month. 19 out of Yemen’s 22 governorates are affected by airstrikes or ground fighting. The death toll continues to rise, with nearly 1,300 deaths reported since the beginning of the conflict in March. More than 300,000 people are estimated to have been displaced, while thousands remain trapped by the fighting, unable to flee to safety. [...]The availability of fuel and other supplies, particularly food and medicine, has severely diminished. Where available, these essential supplies are obtainable at exorbitant prices." So, as long as Australia remains allies with US/NATO which is making a total mess of this region on a variety of flimsy pretexts, but really wants to dominate the oil production there, we can expect more refugees and economic migrants in search of actual economies. In fact it looks almost as if the US/NATO want to destroy the peoples of the Middle East in order to get at the oil. Excuse me for this observation, but it does look like that. The 'migrants' who survive long enough to take boats and planes to Europe and further away have only managed to escape the general destruction. For the European Union - which is heavily influenced by the United States - to suggest that Europe now take quotas of refugees - economic and traditional - rather than suggest that NATO and the US all back off and out of the region, seems frankly ridiculous. The whole situation is a grotesque indictment of globalism and all the leaders of all the 'great powers' who have combined to destroy Libya, suppress Bahrain, and who persist in demonising and attacking Syria's government, supporting Saudi and Qatar aggression, stirring up sectarianism and occupying and privatising the wealth of countries where they have no business. And of course, our interference in Ukraine will also produce refugees, although so far Russia has taken in the majority. Then again, the neo-con influence in European Union is not above hoping to reduce wages in Europe by deploying refugee/migrant quotas. For them it is probably like making lemonade out of lemons or something. Unfortunately the same predatory attitude is apparent in Australian industrial relations. "Pas question qu'il y ait des quotas de migrants" en Europe, déclare François Hollande. Après Manuel Valls, c'est au tour de François Hollande de marquer son opposition à la proposition de la Commission européenne d'imposer des quotas d'accueil de migrants aux Etats membres de l'Union européenne. "Il n'est pas question qu'il y ait des quotas d'immigrés parce que nous avons des règles" sur "le contrôle des frontières et des politiques de maîtrise de l'immigration", a déclaré le chef de l'Etat, mardi 19 mai, lors d'une conférence de presse commune avec la chancelière allemande, Angela Merkel. EU quotas for migrants crossing the Mediterranean sea come into rough waters. Quota proposals were drawn up in response to the refugee crisis that has seen hundreds of people drown off the coast of Italy as the attempt to flee Libya. A quota system to be imposed on member states stipulates how many refugees each country should accept is rapidly losing support with France now joining the “No” camp. The UK last week said it would opt out of the scheme but now Spain, Estonia, the Czech Republic and Poland among several others are opposed to the idea. Italy’s Prime Minister Matteo Renzi, whose country is bearing the brunt of the migrant surge. The numbers are far too numerous to accommodate. Local problems need to be addressed locally, not adding it to a global problem. The best way to stop the drownings at sea is to stop the boats. Germany is accepting 200,000 asylum seekers, but Home Office spokesman said the proposal was “unacceptable” to the UK. Britain accepted 31,745 refugee cases last year but could see the number more than double to the level seen in other EU countries. There's conflict in Libya, due to civil war. However, the nation has also become a transit point for sub-Saharan Africans who previously sought work in Libya and for Syrian refugees attempting to get to Europe by way of North Africa. Open borders are not feasible, and Europe cannot help but say no to most refugees because the continent simply does not have the means to keep all migrants and refugees in the long term. Has Saudi Arabia reason to be "furious with the United States"? Saudi Arabia ... appears to have gone on a rampage because it is furious with the United States for talking to Iran, whom it considers a religious enemy. Given the record of the United States since 1990 – genocidal sanctions against Iraq after 1990, the Gulf War of 1990-1991, the invasion of Afghanistan in 2001, the invasion of Iraq in 2003, complicity in the overthrow of Muammar Gaddafi in Libya in 2100, the proxy terrorist war against Syria which has claimed over 220,000 lives since March 2011, installation of the neo-Nazi regime in Ukraine in February 2014 – I think it highly unlikely that the United States would ever act out of good intent. Siding with the Islamic Republic of Iran against the despotic, pro-imperialist Kingdom of Saudi Arabia would appear on the surface to be an act of good intent on the part of the United States. However, given the the number of times in history where appearance has differed markedly from what actually occurred, 1 I would need more evidence before I am convinced that, on this occasion, the United States has truly sided with Iran against Saudi Arabia. 1. ↑ One striking example is include the sinking of the USS Liberty by Israeli warplanes on 8 June 1967, the fourth day of the Six Day War. The clear intention of Israel was to ensure that there were no survivors and blame Egypt for the sinking of the Liberty, thereby providing President Johnson a pretext to join the war against Egypt. Had a nearby Soviet warship witnessed the incident, their would have been no survivors. Regarding the presence of witnesses aboard a Soviet warship referred in the paragraph above, I believe I read this on a previous occasion. However, I am not able to find, in any of a number of otherwise informative articles about the USS Liberty incident, any mention of this or any explanation of why the attack was stopped – a suprising omission. They only stopped at the approach of a Soviet ship, after killing 34 crew members, mostly engineers, technicians and translators. My recollection was correct after all.